The short-beaked echidna is believed to use olfactory cues from a cloacal scent gland to attract and locate mates during the breeding season. We investigated the chemical composition of echidna secretions, including cloacal swabs and solid, "waxy" exudates from the cloaca and spurs. Scent samples from 37 individuals were collected over a 1-year period and analyzed using a range of different analytical techniques. A total of 186 compounds were identified, including volatile carboxylic acids, aldehydes, ketones, fatty acids, methyl esters, ethyl esters, terpenes, nitrogen- and sulphur-containing compounds, alcohols, and aromatics. Long chain and very long chain monounsaturated fatty acids, sterols, and sterol esters were identified as the major constituents of solid exudates, some of which have not previously been described from any animal skin gland. 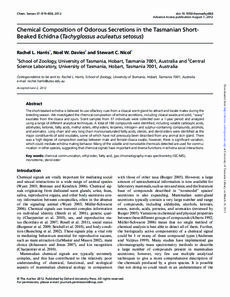 There was a high degree of composition overlap between male and female cloaca swabs; however, there is significant variation, which could mediate echidna mating behavior. Many of the volatile and nonvolatile chemicals detected are used for communication in other species, suggesting that chemical signals have important and diverse functions in echidna social interactions.